Hi Friends, I’ve been driving the local mountains a bunch this last weekend. First Leonard and I headed out to Yuma to play a couple of hits and our trek through the endless winding Freeway 8 east through the hills above Alpine was pure magic! Rain and green as far as the eye could see. This is a good time for California and the quest for water. Next, on Saturday I played a gig in Descanso on a ranch and there again, beauty and wide open space. Good to know that if you need some air inside your head it can be found! This video just surfaced on YouTube from my recent trip to Germany with Larry Coryell. The song is one of Larry’s modal excursions and he’s ripping it up! This is from my recent Germany tour and that's Larry's wife Tracy on the far left. She can sing! 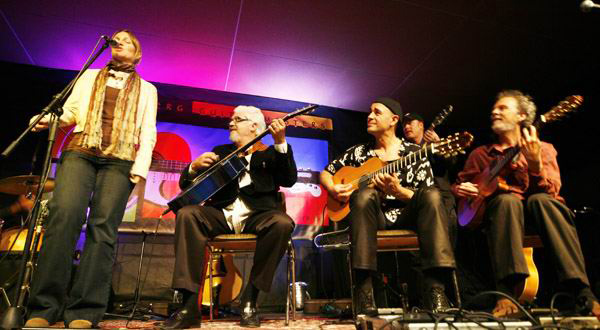 Then it's the one and only Larry Coryell, Antonio Forcione, Ulf Wakenius in the back and me on the far right. Burn factor six! 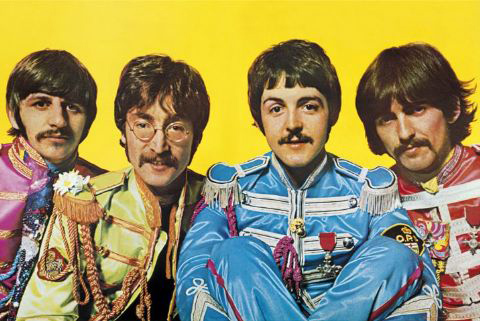 The big news for this week is our upcoming free concert playing all Beatles music. I grew up with their songs occupying the major portion of our household airwaves. Heck, most of us probably did. These tunes hold so much meaning for me. Every album that came out was an historic event and each album brings back wonderful memories of growing up and having a rocking soundtrack for that era of my life. It’s a thrill to devote an entire concert to their music and explore how they sound with my jazz and Brazilian angle on things. Sprague, Barnaby Finch on keyboards, bassist Gunnar Biggs, drummer Duncan Moore and I’ll play guitar. And this just in, young Kate Sprague will sing a tune too! The songlist is a collection of our favorites including a Latin version of “Got to Get You into My Life”, a full on India romp through “Within You, Without You”, an up jazz swing on “Can’t Buy Me Love”, a fusion funk on “Come Together” and an Afro pop spin on “Imagine”. And many more too! The concert is free and it’s on Saturday afternoon. I hope to see you all. I looked all around Encinitas to see if we could find some uniforms like these but alas, I struck out. Actually I've been writing charts out and didn't even look. I think Birkenstocks will be just have to do. Hah! Also on for this week is my return to the Roxy on Thursday eve. I’ve been in and out there lately ‘cuz all of these other Thursday gigs keep landing in my world. I love the place and it’s always fun tuning in again. And last for the week is a Sunday afternoon gig at The Bernardo Winery with Lisa on vocals and Bob Magnusson on bass. Big fun! That’s it friends and Obladeblada! 1 PM Leonard and I are playing a free afternoon concert at Mesa College in the music department. Duncan Moore  drums 2 PM We're presenting our jazz and Brazilian view of the amazing music of the Beatles. Bob Magnusson  bass 2 PM Cool little gig during the day out in the country next to Rancho Bernardo. Tripp Sprague  sax and flute 8:30 PM Come and hang with us for some incredible food plus music overlooking the ocean. Big fun! 8:30 PM Kevyn and I expressing sound in the duo format. Tripp Sprague  sax, flute and percussion 7 PM We'll play a night of samba and jazz at the beautiful O'side Art Museum. Sabino  bass 7 PM We're heading south for our yearly visit to the tip of Baja. We've got gigs on a bunch of the nights and of course there will be a ton of ocean time to even out. If you're going to be down there, let me know and I'll give you the details. 7 PM They've got a brand new library in Fallbrook and we're thrilled to bring some music for this new space! 7 PM We set up right there and as the weary travelers come and hunt for the luggage there we are playing some jazz to welcome them home! It's a cool scene. 6 PM Leonard and I are playing a house concert in the San Diego area.